B U B B L E G A R M: Review - Bourjois 10hr Sleep Effect Foundation! 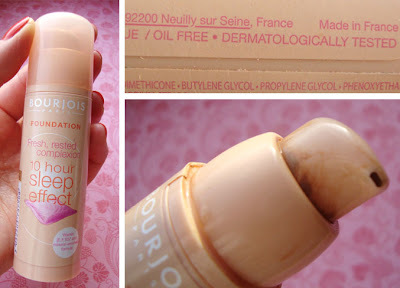 Review - Bourjois 10hr Sleep Effect Foundation! Finally, my review on this foundation! Bourjois 10 Hour Sleep Effect Foundation is an anti-fatigue foundation enriched with a high concentration of vitamins E, F, B5 and minerals. Claiming to give you a fresh complexion even if you haven't slept for 10 hours. Believe it or not, this was the first ever foundation I tried about a year and a half ago and I actually went through quite a few bottles of it. I also wore it on my wedding day which says a lot. But, curiosity got the better of me and I started exploring as time went on. This time when I repurchased recently I actually took my time in reading everything on the bottle, I discovered that it was OIL FREE which really brightened up my day. The packaging is clean and simple with a pump applicator. The formula of this is very thin, it has a watery and creamy consistency. BASICS: It has medium coverage feeling very light on the skin and dries to a dewy finish purely because of the consistency - it has no shimmer particles. However, after it sinks into your skin it's not as dewy, it looks more like skin. It evens out the skintone with a buildable coverage. When set with a powder, this foundation lasts the majority of the day on me. However, depending on primer, moisturiser and your skin type this will vary. It is no way a long lasting foundation like Revlon Colorstay. How do I apply it? I use it a few different ways depending on how much time and coverage I want. I sometimes use my fingers, a Mac 187, Clinique foundation brush or my Everyday minerals flat top kabuki which gives me maximum coverage. In the photo below I used the Mac 187 stippling brush. I then set it with a sheer powder. The flash interferes with the true finish and colour, but I thought it would be nice to include a photo regardless. What do i think overall? I think that this is a great foundation to achieve a healthy and rested look, I notice the freshness and life to the skin once this is used. It is particularly perfect for the morning after which means this foundation actually delivers what it claims to do! I think it's also great for aging skin as it really helps to achieve a youthful look, My mum uses this and she loves it. There is a downside though, it is available in 6 shades and does not cater for the darker skin tones. (Bourjois take note and action.) I use '74 Beige' and '75 Apricote' depending on how tanned I am. Even looks nice on the swatch. I really love this foundation. Even though my skin isn't the best I find that it does a good job of covering while not being heavy. Love it! @Jennie thank you :) amd I totally agree it covers very well without being heavy. I have a question, does this foundation contain any shimmer particles that result in this dewy finish or it's just a moisturizing formula? @Sabrina yes it's perfect for summer, it's crazy how we forget things we used to love. @India oooo, you are welcome. Take ur regular foundation with you and compare swatches. @Seera you are welcome, glad I could be of assistance. @cbsg5861 aaah good question, there are no shimmer particles, it's just purely because of the consistency that it gives a dewy finish. Yes, even though it's oil free it's still perhaps too moisturising for oily skin. It looks amazing on you and I think the pump applicator is useful.Thanks for the review I'm going to try it on my skin too. Great review, might have swayed me on my next foundation. wow, this foundation look beautiful on your skin! i love having a dewy look to the skin and this foundation looks like it definately achieves it! I like the idea of something that is medium coverage, and I have noticed in the past few posts where you've used it, I thought you weren't wearing any foundation. Exactly the kind of thing I go for in a foundation. It's far too humid here for me to use this in the summer, but it seems like a good winter dry skin product. Yet another product to add to my UK shopping list. Where can I pick this up, next time I'm there? I was very impressed with this but stopped using it for some reason,then I bought a bottle of it again cos I can't be bothered to try out endless foundations and I am wondering why I stopped now,I really like it and its cheap too.It gives a very natural look. @Ana My mum uses this daily as an undereye concealer, she wont let anything else near that area. Ah yet another foundation that I can't use! haha Thanks for your e-note to Bourjois! I for one tend to limit/avoid brands that don't have my foundation colors. I just recently stumbled upon your blog, I love it. i def will give this one a try!!! Also i was just wondering if you Turkish? I'm half cypriot and you look turkish so thought i'd ask. Take care!